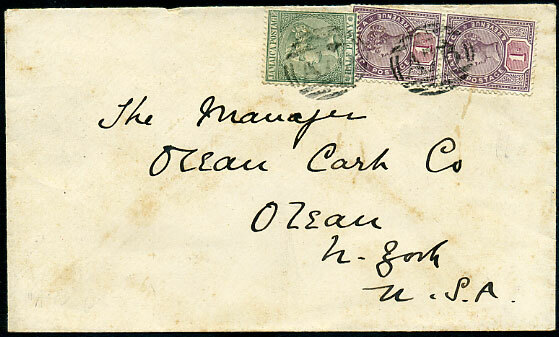 1891 cover to Olean, New York with QV ½d, pair 1d Keyplate pmk'd "A76"(O), reverse SPANISH-TOWN B/MR 5 91 despatch cds. 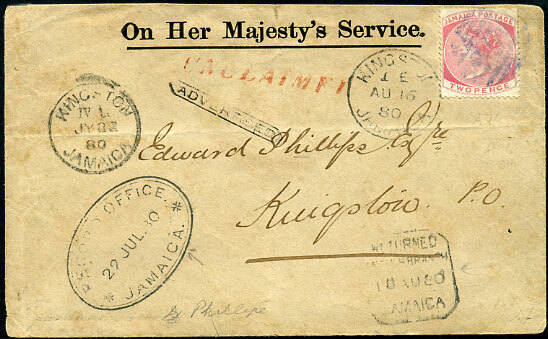 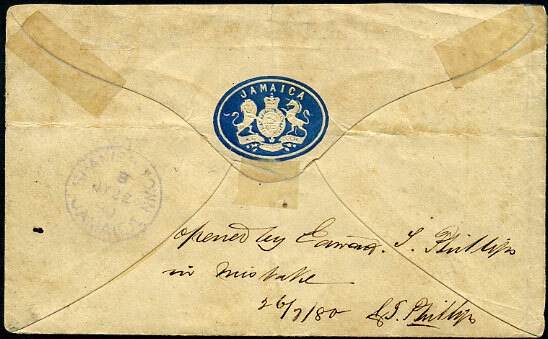 1888 cover to Kingston with QV 2d slate (SG.22a) tied "A47" with HOPE-BAY A/7 MR (88) and Kingston MR 8 88 sqc arrival on reverse, some toning. 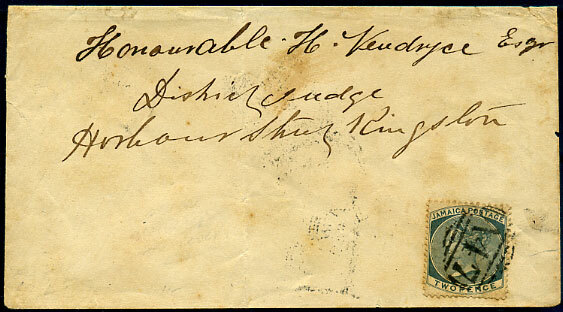 tying "TWO PENCE/HALF PENNY" on QV 4d red-brown (SG.30) with "HALF.-" variety (looks like "HALE) on cover to Scotland b/stamped Port Maria FE 1 91, New York FE 18 91 and Dundee MR 2 91, toning, small part flap removed. 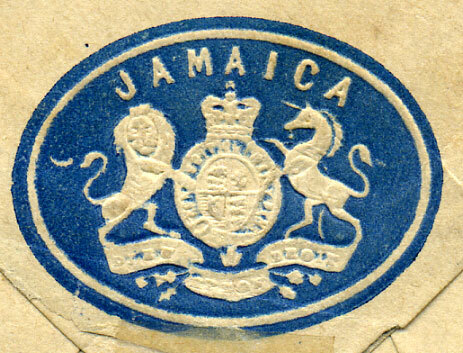 Village covers for this issue seldom encountered. 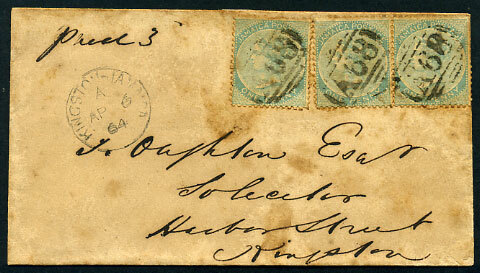 on QV 2d slate CA wmk (SG.20a) cover to Ferguson & Small, Wentworth, Port Maria b/stamped A/22 DE 86.
locally addressed cover with 3 x QV 1d pale greenish blue Pine wmk (SG.1a) b/stamped PORUS AP 5 1864/A broken dbl-arc, overall toning but a rare Pine wmk cover for this office. 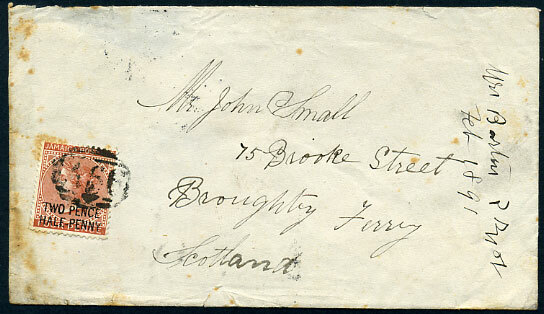 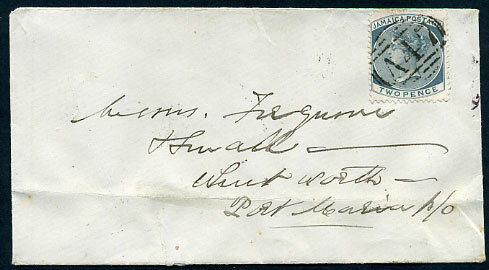 Type H on vertical strip of four QV 2d pale rose Pine wmk (SG.2) on miniature entire (111x52mm) dated C/AP 1 61 internally to Mandeville P.O., one stamp with clipped corner. 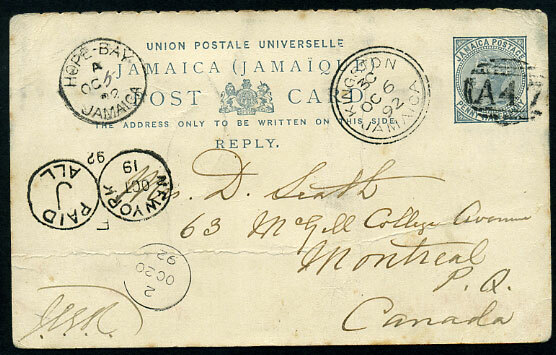 A/OC 5 92 on reply portion QV 1½d slate UPU Reply Card to Montreal, Canada, full reverse text.